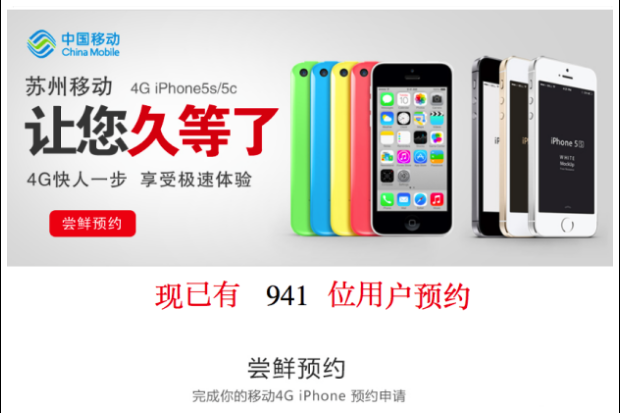 According to Fortune, China Mobile has begun quietly taking pre-orders for Apple’s iPhone 5s and 5c smartphones. The screenshot below reportedly originated on a website owned by a subsidiary of China Mobile. A potential deal between Apple and China Mobile, China’s (and the world’s) largest mobile carrier has been in negotiation for more than six years. Finally, however, it seems that the two giants have come to an agreement. Back in September, we learned that Apple’s newest smartphones would be compatible with China Mobile’s network, though neither company made any announcements regarding iPhone availability on the network. Just last week, China Mobile announced it would get 4G LTE, which was another hint in the iPhone direction. Suzhou Mobile is the website owned by China Mobile’s subsidiary, and according to Fortune, a great city to test out a soft launch of the iPhone with 5 million relatively wealthy citizens. Reports have swirled lately that China Mobile would begin selling the iPhone 5s, 5c on December 18, so we should have a firm answer in the next month or so. Update: CNN spoke with a China Mobile’s spokesperson this morning, who said that there was no deal yet with Apple.